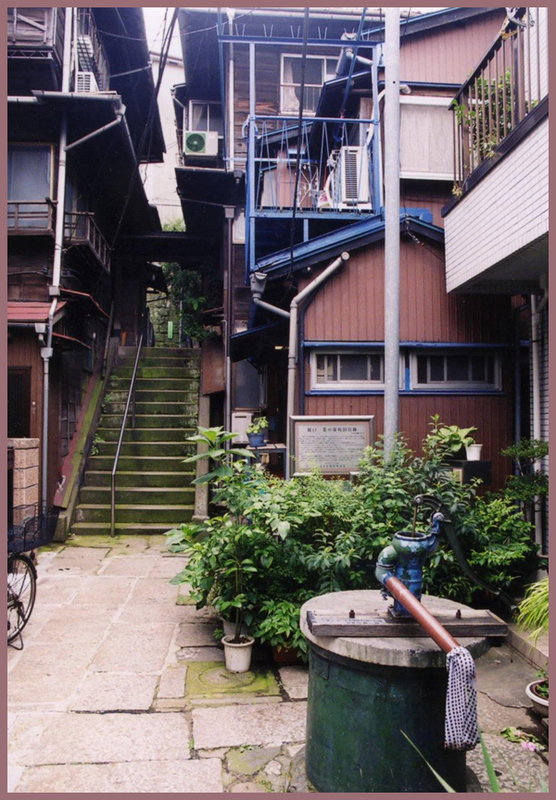 In the Edo period, there lived mostly townspeople and craftsmen in this area. There were also many cloth and kimono shops, like 布袋屋 Hoteiya, 恵比寿屋 Ebisuya and 亀屋 Kameya. Some craftsmen make special 雛人形 Hina dolls for the Hina Doll Festival. When Tokugawa Ieyasu first came to Edo, this area was all sea, a great Inlay until Hibiya. In 1603, Ieyasu ordered the landfills of this area. The Lord of Owari became the supervisor of the landfill here, hence the name of the area. 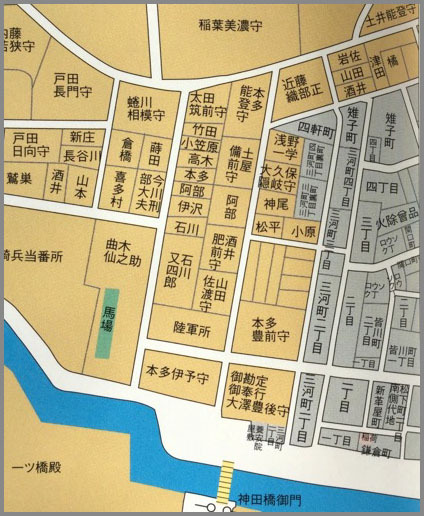 Until 1930, the area belonged to 東京府東京市京橋区 Kyobashi. 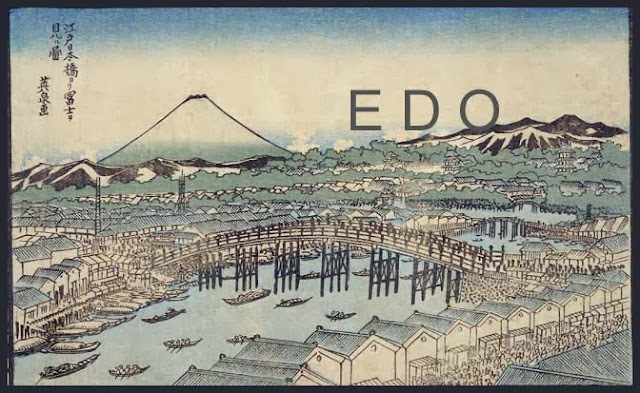 was a feudal domain of Japan in the Edo period. 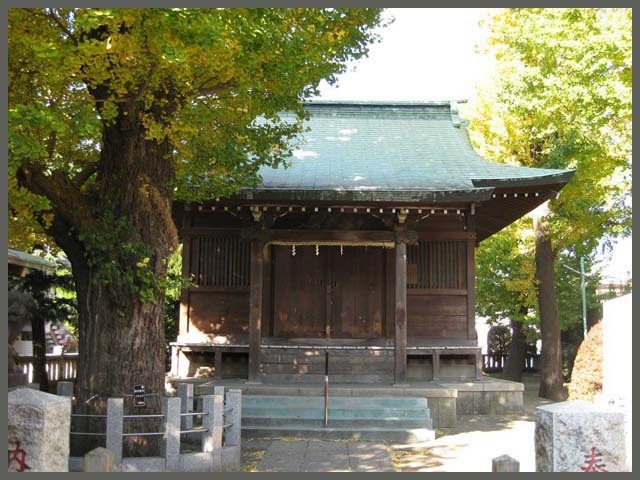 Located in what is now the western part of Aichi Prefecture, it encompassed parts of Owari, Mino, and Shinano provinces. Its headquarters were at Nagoya Castle. At its peak, it was rated at 619,500 koku, and was the largest holding of the Tokugawa clan apart from the shogunal lands. The daimyō of Owari was Tokugawa-Owari family, the first in rank among the gosanke 御三家 three Tokugawa families . Tokugawa Yoshinao (1607–1650), the 9th son of Tokugawa Ieyasu.
. Owari shi Kannon 尾張四観音 The Four Kannon Temples of Owari . - They were erected in the auspicious directions to protect the castle on Nagoya from evil influence.
. Owari Shippo 尾張七宝 Enamel art from Aichi . The main estate (kami yashiki) of the Tokugawa family estates from 紀州徳川家 Kishu and 尾張徳川家 Owari were located here. The 中屋敷 "middle estate" of the 井伊家 Ii clan was also located here. 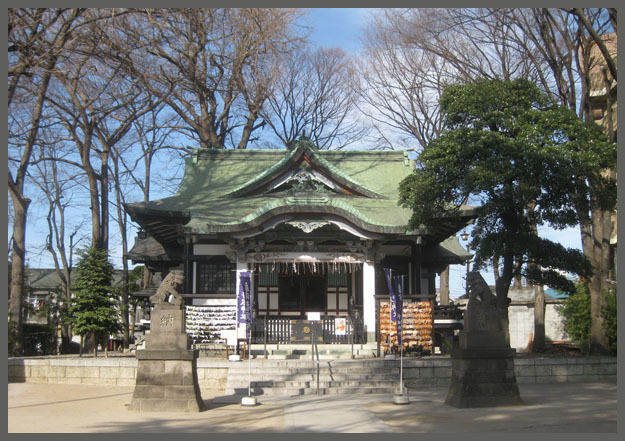 In the Edo period, this was mainly the name of the slope 紀尾井坂 Kioizaka. The bridge connects to 紀尾井町 Kioicho, the area with the estates of the Kishu Tokugawa, Owari Tokugawa and Ii from Hakone were located.
. hana no ka-petto 花のカーペット flower carpet .
. Kioicho no densha 紀尾井町の電車 the train from Kioi village .
. Chūō ku 中央区 Chuo Ward - "Central Ward" . Hongoo, Hongō 本郷 Hongo district, "original hometown"
Hongō was a ward of the former city of Tokyo until 1947, when it merged with another ward, Koishikawa, to form the modern Bunkyō ward. The University of Tokyo (東京大学, Tōkyō daigaku, abbreviated as Todai (東大, Tōdai), is a major research university located in Tokyo, Japan. The University has 10 faculties with a total of around 30,000 students, 2,100 of whom are foreign. 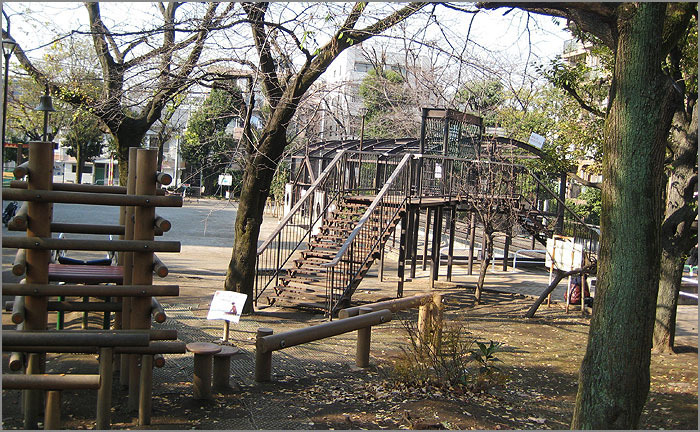 Its five campuses are in Hongō, Komaba, Kashiwa, Shirokane and Nakano.
. Hongo and Haiku .
. Morikawa 森川宿 Morikawa rest station .
. Yushima 本郷湯島 Hongo Yushima . The name dates back to 1460. During the Edo period, many farmers growing chrysanthemums in large fields lived on this slope. There are other slopes near by, 本妙寺坂 Honmyojizaka, 鐙坂 Abumizaka, 梨の木坂 Nashinokizaka . . . In 1628, it was included in the wider area 大縄拝領地. In 1652, the great fire destroyed most of the area. In 1682, it came under the jurisdiction of the 町奉行 Machibugyo magistrate of Edo. A 岡場所 cheap pleasure quarter was established . Around 1820 there lived more than 288 families in this district. 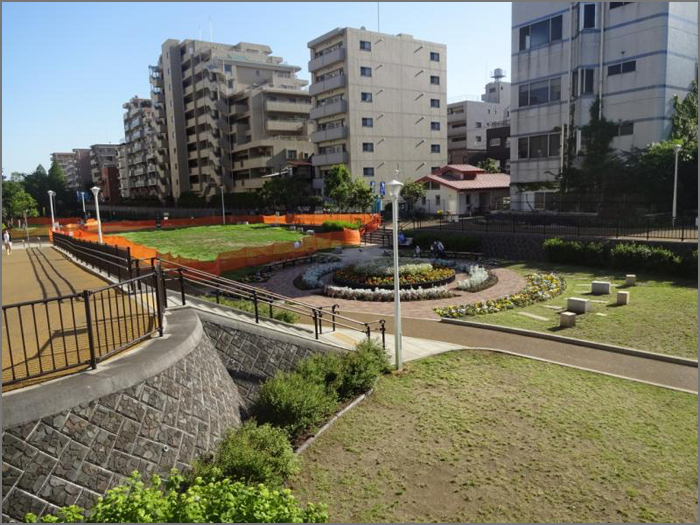 The estate 道造屋敷 Michizo Yashiki was in this district.
. March 2–3, 1657 - Great Fire of Meireki 明暦の大火 . 振袖火事 Furisode Fire - started maybe at the temple 本妙寺 Honmyo-Ji in this district.
. Higuchi Ichiyo 樋口一葉 (1872 - 1896) . Former Ichiyo Higuchi Kikuzaka Residence is in Kikuzaka. The ido 井戸 well she used is still there. There is also 一葉が通っていた質屋跡 the remains of the pawn shop she frequented.
. 石田波郷 Ishida Hakyo (1913 - 1969) . William Adams (1564 – 1620). 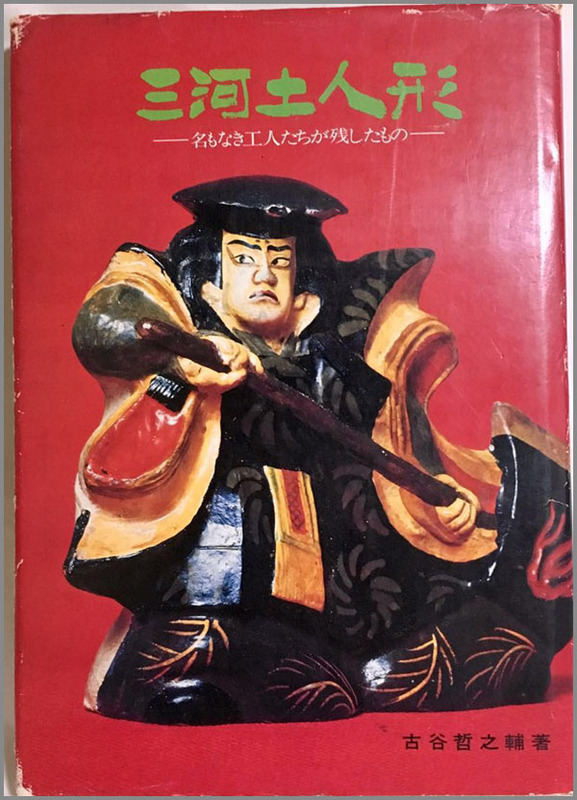 Miura Anjin (三浦按針 "the pilot of Miura"). 黒沢市兵衛 Kurozawa Ichibei. 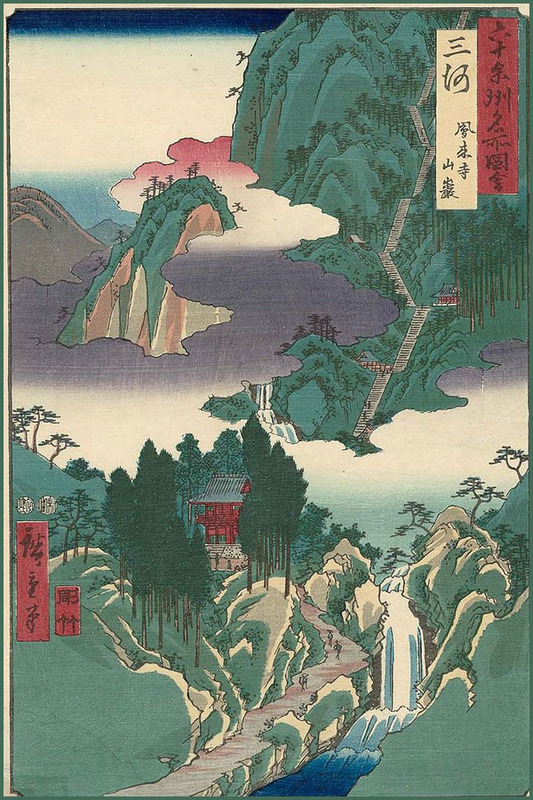 Village headman in 1695.
. Dokanyama 道灌山 Mount Dokanyama . .
太田道灌 Ota Dokan (1432 - 1486), builder of the first Edo castle. In 1705 Fuyukiya Yaheiji became the headman of district. 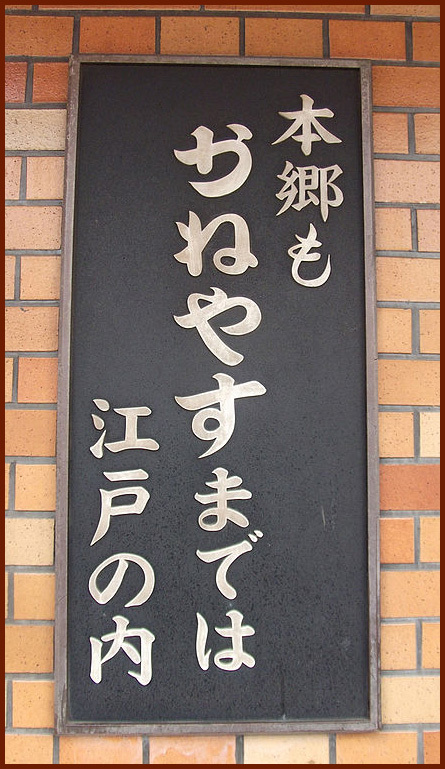 Fuyukiya 冬木屋 was a rich lumber merchant family.
. Honjo-Aioicho district 本所相生町 . Priest Honinbo Sansa 本因坊算砂 (1612 - 1623), famous master of the Go play. To improve one's skills as one gets old and studies with its opponents, like a good couple which gets old together. aioi was written 相老い to get old together. 堀江六郎 Horie Rokuro, a local fisherman from Edo. 島田左内 Shimada Sanai, village headman around 1620. The village headman 飯田喜兵衛 Iida Kihei. 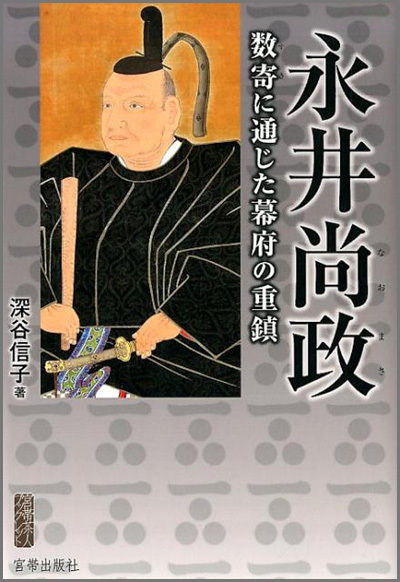 Saeki Yataroo 佐柄木弥太郎 Saeki Yataro, a togishi 研ぎ師 polisher of swords and blades. Lady Kasuga 春日局 Kasuga no Tsubone ((1579 – 1643), the wet nurse of the third Tokugawa Shogun Iemitsu. 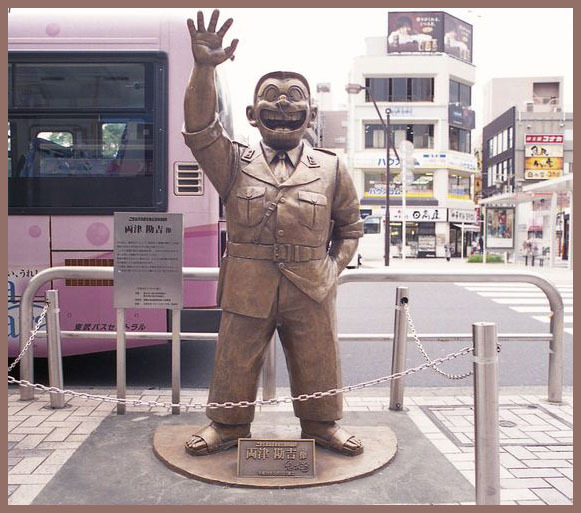 Kiyosumi Yahē 清住弥兵衛 Kiyosumi Yahei, headman of the area. 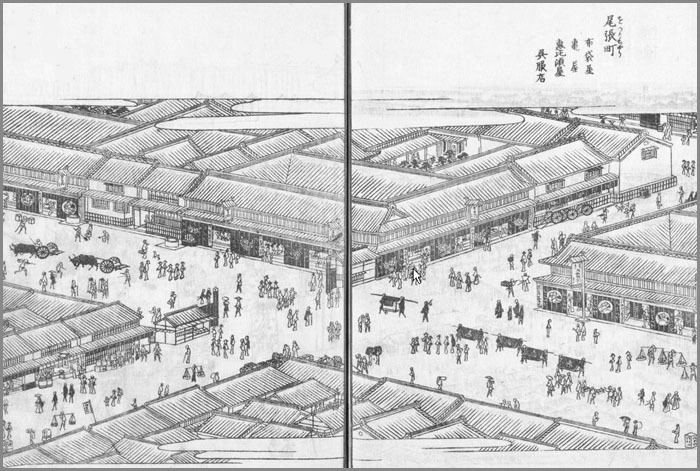 In 大奥 Ōoku, the Women's quarters of the Edo castle lived an Elder Lady named 松ヶ枝 Matsugae. 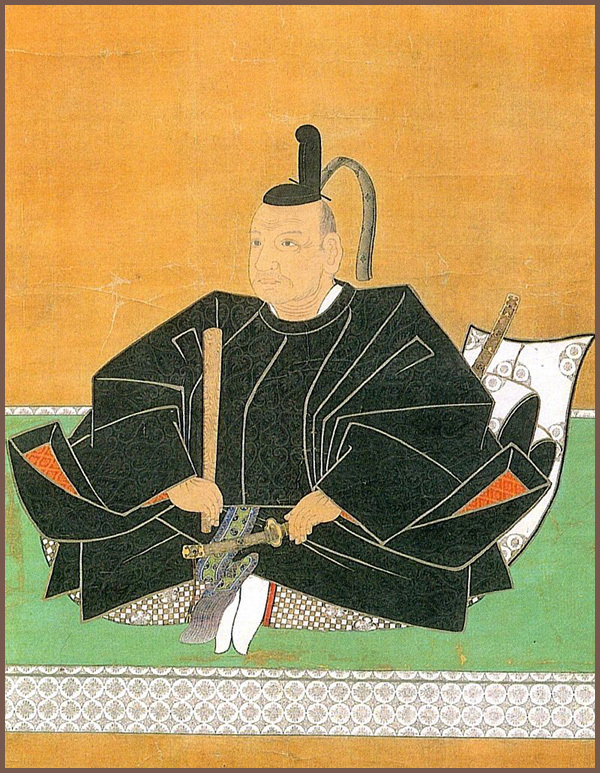 小川九郎兵衛 Ogawa Kurobei (1622 - 1670), headman of the district. 音羽 Otowa. Retainer of 桂昌院 Keisho-In (1628 - 1705), Mother of Shogun Tokugawa Tsunayoshi. Reigan 霊巌 Priest Reigan (1554 － 1641) - 雄誉霊巌 Yuyo Reigan. Saruwaka Kanzaburō　猿若勘三郎 （1598 - 1658), founder of Edo Kabuki. 荻野松庵 doctor Ogino Shoan, He died in 1665. He developed the farming area, 松庵新田 Shoan Shinden. named after its developer, 砂村新四郎　Sunamura Shinshiro, the brother of 砂村新左衛門 Sunamura Shinzaemon (1601 – 1668). 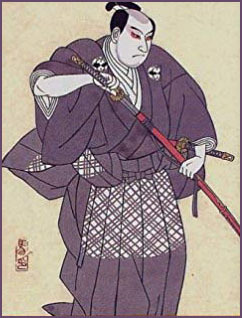 Tobisawa Jinnai 鳶沢甚内, Samurai from Odawara. Jan Joosten van Lodensteyn - ヤン・ヨーステン ファン・ローデンスタイン (1557 - 1623) / 耶揚子. Kashiwagi mura 柏木村 Kashiwagi village, "oak tree"
A triangular piece of land, surrounded by the river 神田川 Kandagawa, the 青梅街道 Ome Kaido and the modern road 小滝橋通り Otakibashidori. Kashiwagi Emonnosuke Yorisue 柏木右衛門佑頼季/ 柏木右衛門佐頼秀. 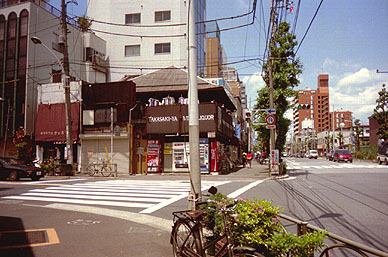 Kashiwagi (North-Shinjuku) to 角筈 Tsunohazu (West-Shinjuku). The temple dates back at least to 940. Priest 貞崇僧都 Jozu (Teizu, 866 - 944) built a 薬師堂 hall for Yakushi Nyorai and placed a Yakushi statue here. 藤原秀郷 Fujiwara no Hidesato came here to pray for his health on the war campaign to the North, fighting 平将門 Taira no Masakado.
. Lady Kasuga 春日局 Kasuga no Tsubone . 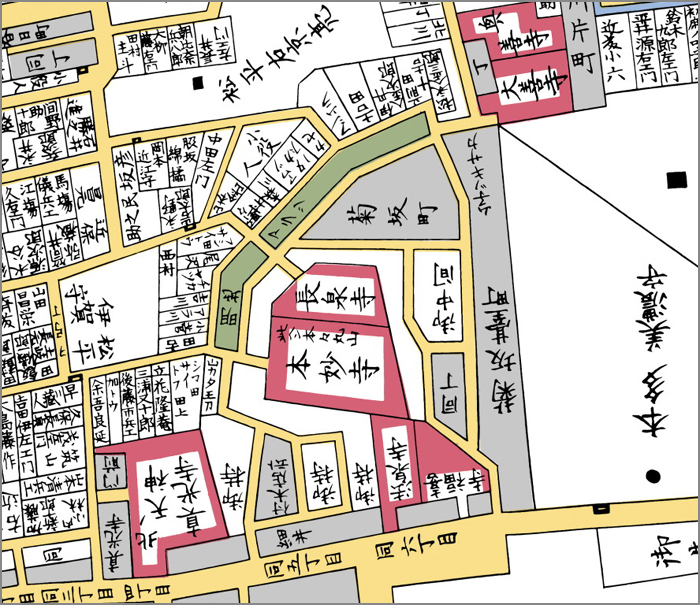 During the Edo period, the villages of 柏木 Kashiwagi and 大久保 Okubo were agricultural districts on either side of Hyakunin-cho where samurai warrior residences were located. These villages were known as vegetable producing areas. 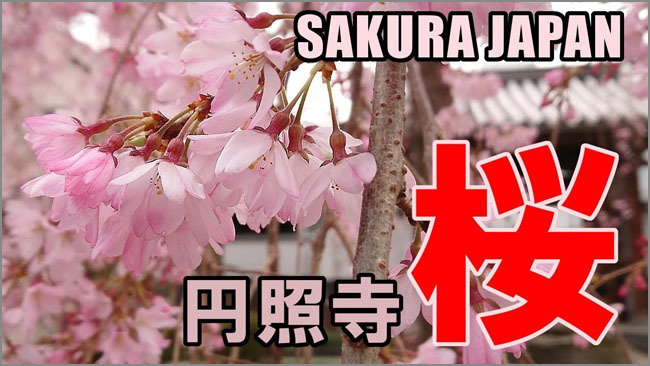 The samurai families cultivated plants and flowers and this a tradition was continued through the Meiji period (1868-1912) even though the samurai class itself had disappeared by then. The area was particularly famous for its azaleas (tsutsuji). Since Hyakunin-cho was a residential area of the constables (doshin) belonging to the Hyakunin (hundred-man) brigade of shooters operated by the Bakufu military government during the Edo period. 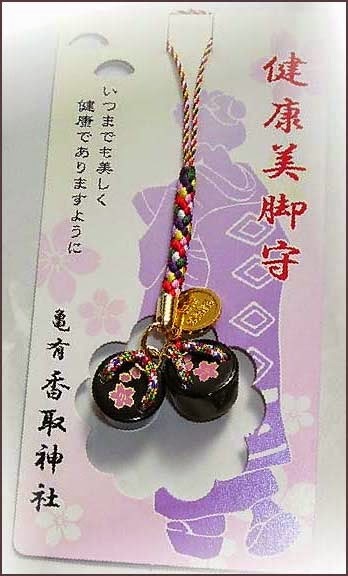 During festivals held at the Kaichu Inari Shrine, they fired ceremonial volleys with firelocks.
. Kashiwagi Soryuu 柏木素龍 Kashiwagi Soryu (? - 1716) - 儀左衛門 . Samurai from Awa, Tokushima. Worked for Yanagizawa Yoshiyasu (time of Shogun Tsunayoshi). Sarumino. 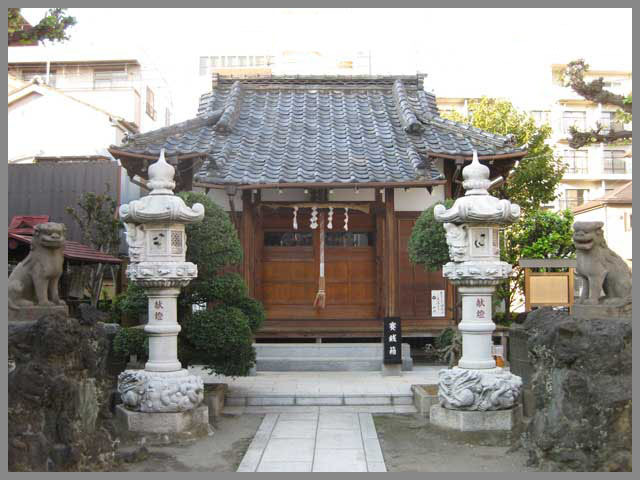 In 1686, the Kashiwagi family relocated to Odawara's Nabe Town under the auspices of the Okubo family, where they started a casting business as well. When Yamada Jirozaemon's descendants moved to Tokyo in 1891, the Kashiwagi family purchased the Yamada family's casting facilities lock, stock and barrel. With this, the Kashiwagi family's production capabilities increased dramatically, and the techniques they developed form the backbone of today's Odawara casting methods. 神田区三河町 Kanda Mikawa cho was a rather long and thin district in the Edo period. The name refers to the Mikawa region (now Aichi prefecture), where Tokugawa Ieyasu was born. When he came to Edo in 1590, he had his 下級武士 junior Samurai retainers settle in this district. It is one of the old districts in Edo. 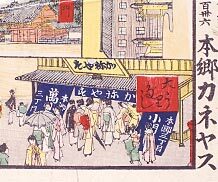 In the Meiji period it got the name of 神田区三河町 Kanda Mikawa cho. 神田司町 Kanda Tsukasa machi and the old name was lost.
. Tokugawa Ieyasu 徳川家康 (1543 - 1616) .
. hachoo miso, hatchoo miso 八丁味噌 from the Mikawa region. .
a favorite food of Tokugawa Ieyasu.
. Mikawa dolls 三河人形 . made in the towns of Toyokawa and Toyohashi and many other places in Aichi prefecture. 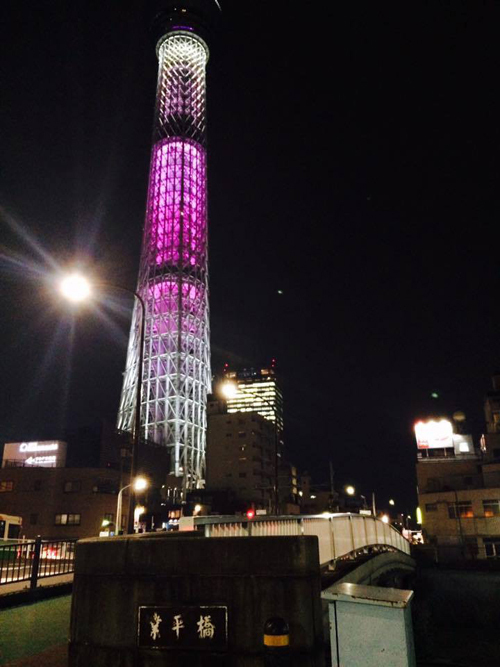 was an old province in the area that today forms the eastern half of Aichi Prefecture. Its abbreviated form name was Sanshū (三州 or 参州). Mikawa bordered on Owari, Mino, Shinano, and Tōtōmi Provinces. Mikawa is classified as one of the provinces of the Tōkaidō. Under the Engishiki classification system, Mikawa was ranked as a "superior country" (上国) and a "near country" (近国) in terms of its distance from the capital. ..... However, by the Sengoku period, the province had fragmented into many small territories largely dominated by the Matsudaira clan, and contested by the Imagawa clan to the east and the Oda clan to the west. It was united under Tokugawa Ieyasu after the power of the Imagawa had been destroyed at the Battle of Okehazama. After the creation of the Tokugawa shogunate, parts of the province were assigned as feudal domains to trusted hereditary retainers as fudai daimyōs, with large portions retained as tenryō territory administered by various hatamoto directly under the shogunate. During the Edo period, Mikawa was the only area permitted by the shogunate to produce gunpowder, which led to its modern fireworks industry. ..... The entire territory of former Mikawa Province became part of the new Aichi Prefecture in January 1872.
lived in 三河町 Mikawa cho. a Japanese author. His real name was Keiji Okamoto (岡本敬二 Okamoto Keiji). 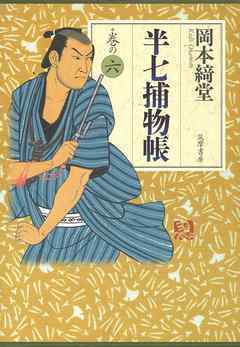 His best known work is the Shin Kabuki play Bancho Sarayashiki.
. Kanda 神田 Kanda district　. 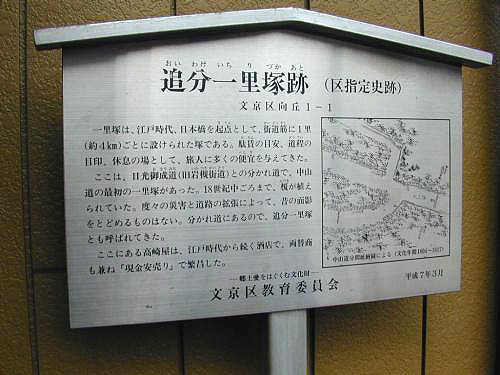 永井尚政 Nagai Naomasa had his estate. 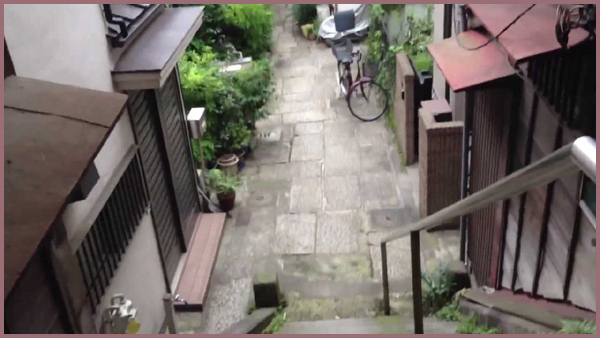 There were no townspeople living in this district, only some Daimyo estates. is an old province of Japan that is now Nagano Prefecture. Shinano bordered on Echigo, Etchū, Hida, Kai, Kōzuke, Mikawa, Mino, Musashi, Suruga, and Tōtōmi Provinces. The ancient capital was located near modern-day Matsumoto, which became an important city of the province. Shinano Province was often split among fiefs and castle towns developed, including Komoro, Ina, and Ueda. Shinano was one of the major centers of Takeda Shingen's power during his wars with Uesugi Kenshin and others. In 1871, during the Meiji period, with the abolition of the han system and the establishment of prefectures (Haihan Chiken) after the Meiji Restoration, Shinano Province was administratively separated in 1871 into Nagano and Chikuma prefectures. These two tentative governmental and territorial units were reconfigured together again in 1876. 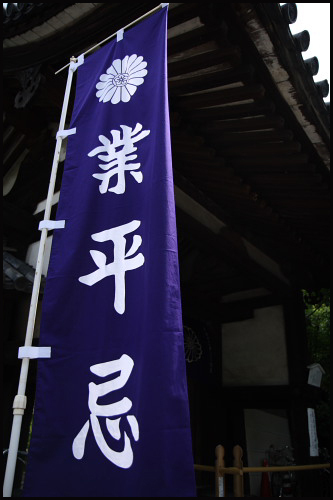 This became the modern prefecture of Nagano, which remains substantially unchanged from that time. ... was a Japanese daimyō of the Edo period, who ruled the Uruido, Koga and Yodo Domains. The eldest son of Nagai Naokatsu, he fought at the Battle of Sekigahara and the Siege of Osaka. 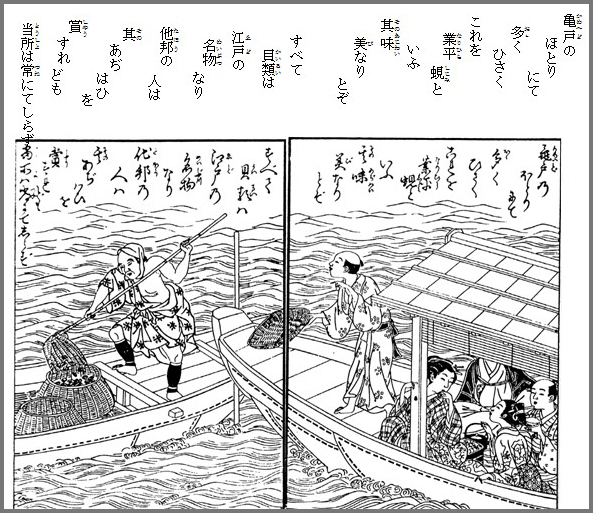 During the Shimabara Rebellion he was assigned to defend Kyoto. Naomasa held junior 4th court rank, lower grade (従四位下 ju shii no ge) and the title of 信濃守 Shinano no Kami. He retired in early 1658 and became a monk, taking the name Shinsai. Gakkai Village, Soka Gakkai Town, or Soka Kingdom. Daisaku Ikeda (池田大作) : The third leader of Soka Gakkai. Komeito (公明党) : A political party founded and supported by members of Soka Gakkai. Seikyo Shimbun (聖教新聞) : Soka Gakkai's daily newspaper. 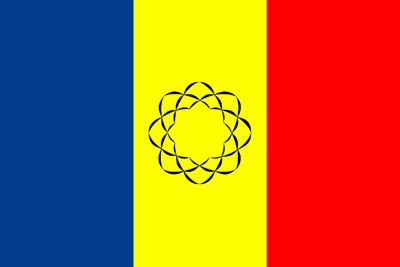 Tricolor flag of blue, yellow, and red are the symbol of Soka Gakkai. Blue means peace, yellow means glory, and red means victory. is a Japanese Buddhist religious movement based on the teachings of the 13th-century Japanese priest Nichiren as taught by its first three presidents Tsunesaburō Makiguchi, Jōsei Toda and Daisaku Ikeda. 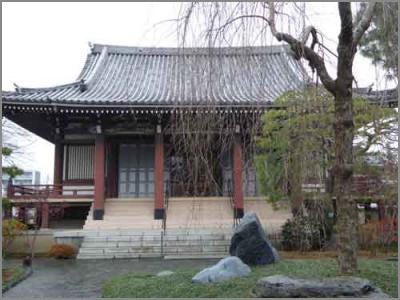 It is the largest of the Japanese new religions and holds the largest membership among Nichiren Buddhist groups. "The Gakkai" bases its teachings on Nichiren's interpretation of the Lotus Sutra and places chanting "Nam Myōhō Renge Kyō" at the center of devotional practice. 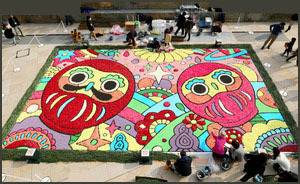 The organization promotes its goals as supporting "peace, culture, and education". Shinano is located in far northern Nagano Prefecture, bordered by Niigata Prefecture to the north. Lake Nojiri and Mount Kurohime are in Shinano. The area of present-day Shinano was part of ancient Shinano Province. The modern village of Shinano was created by the merger of the villages of Kashiwabara and Fujisato on July 1, 1955. Shinano merged with the neighboring villages of Furuma and Shinanojiri to form the town of Shinano on September 30, 1956. If a serpent or snake takes possession of a human, they must perform special exorcism rituals to heal.
. kitsune 狐 the fox in Japanese culture and tales . If a fox takes possession of a human, they must perform special exorcism rituals to heal. Sometimes people are allowed to sit on a Inari fox statue and dance, イナリオドリ inari odori.
. neko 猫 / ねこ と伝説 Legends about cats, Katzen . Cats can take possession of humans. Once a poor old woman was so hungry she killed a cat and ate it. But the cat took possession and the woman begun to run around the eaves of her home. A ghost appears when the dead person has left some unfinished business and grudges in this world. Some take the form of a woman with long tangled hair, with hands hanging down below the breast and no feet. Once a farmer saw such a ghost under 柳の木 a willow tree. Another one was seen in the private graveyard of an estate. But the reason why some can see them is not quite clear.
. Shinano, home of Kobayashi Issa 小林一茶 . Here was the first ichirizuka 一里塚 stone marker mound of the 中仙道 Nakasendo Highway, where the 日光御成道（岩槻街道) Nikko Onari Michi started. 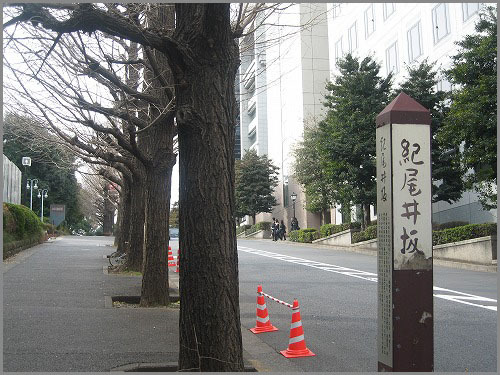 Until the middle of the 18th century, there ware many enoki 榎 nettle trees along the road, but they were cut down to make a wider road for fire prevention and enlargement of the street. The corner shop 高崎屋 Takasakiya in the Edo period was a Sake store and also money changer, who only sold goods for money. The road to the left of the store is the Nakasendo Highway. Hongo belongs to the city of Edo until the store of Kaneyasu. 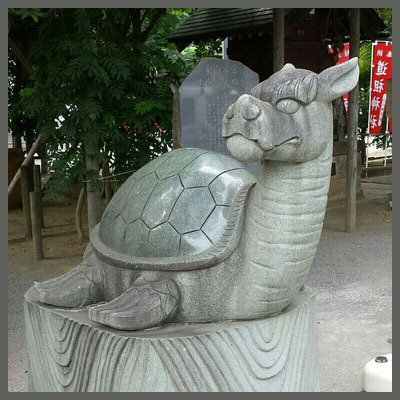 Kaneyasu was a 口中医(歯医者) dentist who came to Edo at the time of Tokugawa Ieyasu. 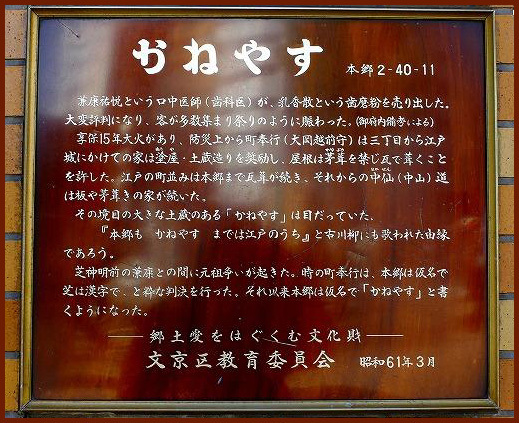 兼康祐元 Kaneyasu Yugen, the third generation, opened the corner store かねやす Kaneyasu in 1617. 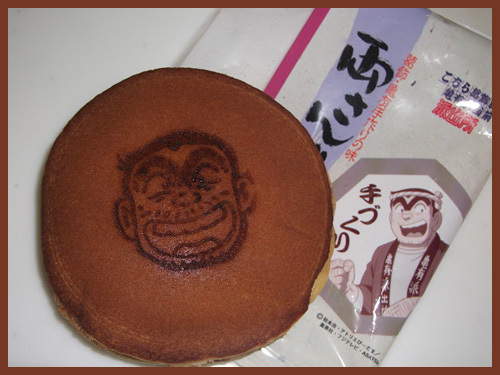 The store also sold nyuukoosan 乳香散 Nyukosan, a kind of toothpaste. 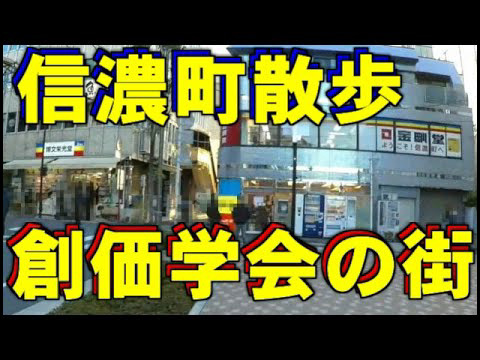 His store was at the traffic crossing Hongo Third District 本郷三丁目の交差点. It remains there to our day, now as a store selling cloths. 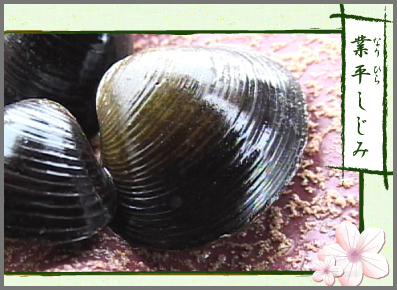 nyuukoo 乳香 francinsense, Olibanum, was an ingredient of Nyukosan.
. Hongō, Hongoo 本郷　Hongo district . Walking along the Nakasendo from the store of Kaneyasu, there was the station 森川宿 Morikawa-juku. The 宿 juku here does not mean a postal station, but just a place to stand and take a rest, tatejuku 立宿.
. Nakasendoo 中山道 Nakasendo Highway . Kinemon was an official of the Edo Bakufu government, taking care of the safety of this crossroads.
. Yaoya no O-Shichi 八百屋のお七　Greengrocer's Daughter Oshichi . She was born in Morikawajuku.